Over the years I have found a radical difference between tenant move-outs when I use the "Triple Play" of forms and move-outs when I don't. Whether it is the tenant's idea to move or if you are requiring the tenant to leave, these forms can save you substantial money in clean up and repairs. Preparation is key when guiding your tenant though the move-out process. The typical procedure for moving out consists of the tenant first giving the landlord "notice to vacate" (Usually written notice). Sometimes it is the other way around and the landlord gives the tenant a Termination of Tenancy Notice (A/K/A 30 day notice or similar). The use of the following forms will mitigate landlord clean up and repair costs and time. 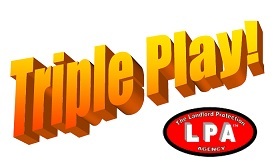 So what is the "Triple Play" of forms that will help you minimize the need for clean up and move-out related repairs? This form is used by the tenant give proper written notice to the landlord when the tenant is vacating and states that the tenant will cooperate with showing the property for re-rental or sale. It includes a place for the tenant to give his forwarding address in order to receive any security refund. It is an excellent way to help reinforce proper move-out procedure. We always staple a copy of this notice to the back of the tenant's lease to be used when the time comes for the tenant to give notice to vacate. has become an important time and money saver. We send this form to the tenants about a week or two before they vacate. It reminds them specifically of certain tasks and cleaning they should perform in order to get a full security refund. This letter instructs the tenants how to lock up and secure the rental until it can be inspected by the landlord/ management, and also where and how the tenants should return all keys. We have found this form to be very effective and it helps tenants to be more cooperative on the way out. Have you ever wondered if the tenants would have done a better job vacating if you gave them specific instructions? Much like the LPA Move Out Reminder Letter, this reminds the tenants to not wait until their last day of tenancy to put out garbage and debris. They are urged avoid clean up charges and deductions from their security deposit and to make arrangements as soon as possible to get rid of their unwanted items, rather than leave them behind in or around the property. Inspecting the Rental for Damages: As much as the tenants may want to do a "walk through" with you to confirm that they will get the full deposit back, DON'T* until after they have moved out. And then do it without the tenants present. There are many reasons I say this. Avoid a confrontation that may cause more damage from a disgruntled tenant at moveout. Let them go out smoothly. Then you are in better control over their refund. As far as inspecting the property and calculating a refund with your Settlement Charges Guide, Property Condition Report checklist and Security Settlement Statement and handling tenants after they leave, check out What Do I Do When the tenant has moved?